To fly as the hawk and eagle has been mankind\'s dream for centuries. Modern sailplanes make soaring and gliding possible, and with them, humans can fly higher, faster, and farther than the greatest of birds, using only an invisible force of nature to stay aloft. The terms soaring and gliding are used interchangeably, and the sport is appealing to pilot and spectator alike. Sailplane enthusiasts have always been explorers, always looking for a more ideal site that will provide the intellectual challenges of soaring as well as the sheer beauty and relaxation the sport can offer. 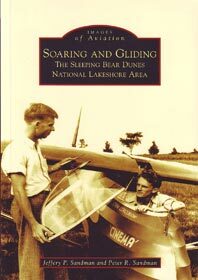 Michigan-based glider pilots and designers found their soaring paradise in the early s when they ventured north to the Sleeping Bear Dunes area. The explorers began to promote the sport to national and international prominence, and many came to make up a veritable who\'s who of American aeronautics. Over a century after Octave Chanute discovered motorless flight on the Lake Michigan dunes, sailplanes, hang gliders, and paragliders still fill the skies.